People will go to great lengths to be “beautiful,” and cosmetics companies know it. What consumers may not know is that they have long risked death and disfigurement for the sake of beauty. Koremlu, a depilatory that contained the rat poison thalium acetate, was also widely marketed throughout the 1930s. It sold at $10 a jar, a small fortune in those days, despite proof that it caused baldness, pain and paralysis. In 1936, Ruth deForest Lamb’s book American Chamber of Horrors, about the Food and Drug Administration’s cautionary display of fraudulent and dangerous products, recounted the story of a woman who developed dark rings around her eyes and neck, followed by bluish black gums and loose teeth. She was found to be suffering from mercury poisoning caused by Gouraud’s Oriental Cream. This “magic beautifier” had been on the market for decades, even though people knew it contained the mercury compound calomel. The federal government had no power to ban cosmetics like Lash Lure, Koremlu and Gouraud’s Oriental Cream, even though they caused horrifying – and preventable -- injuries to women. At the time, the Food and Drug Administration had jurisdiction only over food and drugs, not cosmetics. It was not until 1938 that Congress passed the Federal Food, Drug and Cosmetic Act, which enabled the FDA to initiate action in federal courts to seize Lash Lure and other dangerous products. The measure gave the FDA power to act against dangerous cosmetics through the Department of Justice and federal court system. But the agency’s ability to address unsavory beauty products was limited. The federal law required pharmaceutical companies to prove the safety of drugs before putting them on the market, but no pre-market testing was mandated for cosmetics. Only two pages of the Food, Drug and Cosmetic Act were dedicated to cosmetics — two pages that to this day give the FDA little authority to ensure that personal care products would not harm their users. Because the FDA lacked legal authority and resources to police the market, many dangerous cosmetics products continued to injure the public. The field was left to consumer activists and investigative reporters like Toni Stabile. In 1970, Stabile’s exposé, entitled Cosmetics: Trick or Treat, revealed how little had changed since 1938. She found that the market was flooded with eyeliner containing coal tar dye, banned in eye area cosmetics because of the Lash Lure scandal and linked to severe skin reactions and cancer. A neutralizing agent in home perm kits sent several women to the hospital with chemical burns to their eyes. A combination of synthetic resin and formaldehyde in nail polish base coats caused several hundred women pain in their fingernails, and often the nails fell out. In 2004, EWG launched the Skin Deep cosmetics database, an online resource where EWG scientists have researched ingredients in popular cosmetics and personal care products. It aimed to fill in where industry and government left off. Today, Skin Deep lists more than 78,000 items. The Skin Deep mobile app is coming soon. Today, cosmetics still plague us with sinister threats. Scary truth: even if your mascara doesn’t burn your eyeballs like Lash Lure, it may not be free of toxic chemicals. FDA and European Union rules permit a small amount of mercury to be used as a preservative in mascara and other eye area cosmetics. EWG has waged a long campaign to force cosmetics makers to stop using toxic and endocrine-disrupting chemicals such as phthalates, a group of plasticizers. Some dangerous substances are lumped together under the vague term “fragrance,” meaning consumers can’t even tell if they are being exposed to these chemicals. As EWG reported in 2011, hair straighteners that contain large amounts of formaldehyde, a known human carcinogen and potent allergen, are being sold even though the FDA and Occupational Health and Safety Administration have warned salon workers and their clients that formaldehyde-laced straighteners have caused multiple injuries including dizziness, vomiting and hair loss. Yet the FDA has not removed these products from the market. Toni Stabile passed away in March of this year, but her legacy lives on. She created a fellowship that enables Georgetown University Law graduates like me to work at the Environmental Working Group to improve personal care product safety. As I thank Stabile for her contributions and for giving me an opportunity to make cosmetics safer, I have to ask—why are cosmetics still so poorly regulated? Why can’t we be sure cosmetic products are safe before we put them on our bodies? We should be able to identify the ingredients in our cosmetics, including those currently listed only as “fragrance.” Companies should be required to demonstrate that their cosmetics are safe before they sell them to us. 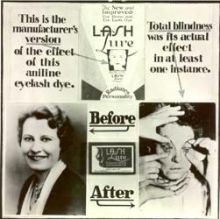 Let’s make sure products like Lash Lure stay a story from FDA's grisly vault.